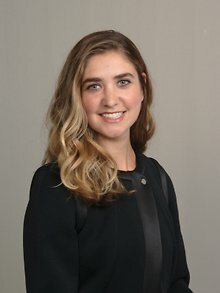 People KATELYN HANSEN | Brailsford & Dunlavey, Inc.
Ms. Hansen, a Chicago native, joined the B&D Chicago office with a commitment to enhancing communities and campus culture through strategic planning and the built environment. She earned her Master of City and Regional Planning degree from Rutgers University with a dual concentration in housing/real estate and urban design. During her graduate program she collaborated on the Bungalow Park Neighborhood Plan, which established resiliency, housing, and economic development strategies for one of Atlantic City’s only year-round residential communities. She’s held various internships at planning and real estate development firms in New Jersey and New York City. Her prior work focused on student housing for Rutgers University, New Jersey municipal housing plans, and real estate development services for New York City's non-profit community. She received the 2016 AICP Outstanding Student Award for her achievements in the study of planning. Prior to earning her graduate degree, Ms. Hansen worked in corporate communications in Chicago focusing on website and app development. She also holds a B.A. degree in English literature and political science from the University of Wisconsin-Madison.